Perhaps not as popular as other poodle hybrids like a Labradoodle or Whoodle, the Chipoo is a smaller dog with its own distinctive features. With one parent being a Chihuahua, the smallest dog breed around and one with an energetic personality, the tiny stature and diverse style of the Chipoo makes them stand out in a pool of poodle hybrids. What else should you know about the little Chihuahua Poodle Mix? Our readers’ most popular and frequently asked questions about the Chihuahua Poodle mix, or Chi Poo. Are Chihuahua Poodle mixes good family dogs? How long do Chihuahua Poodle mixes live? How big do Chihuahua Poodle mixes get? Popularity: The Chipoo, like many other mixed breed dogs, is growing in popularity. Temperament: Playful and smart, this mix may become very attached and protective of its humans. Proper socialization is vital. Without further ado, let’s get into the history of the Chipoo! It’s unclear when the Chipoo first started to appear, but it is a fairly new hybrid. The Toy Poodle Chihuahua mix has a very old and impressive parentage, however. It’s likely that the Chihuahua’s origins trace back even before the Maya people inhabited Mexico. Ancient remains of dogs very similar to Chihuahuas have been found in archeological digs that date back to the 13th century. The Poodle most likely came from Germany, originating around the 15th and 16th centuries before the breed popped up in Spain in the 18th century. Perhaps the Chipoo dog hasn’t been around all that long, but it clearly has longstanding lineage between the Chihuahua and the Poodle. The exact original purpose of the Chi Poo isn’t known. It’s possible that the cross wasn’t even intentional! Chihuahua Poodle mixes aren’t only just referred to as Chipoos or Chi Poo dogs. They also go by the portmanteau names Wapoo, Poochi, and Chipoodle! 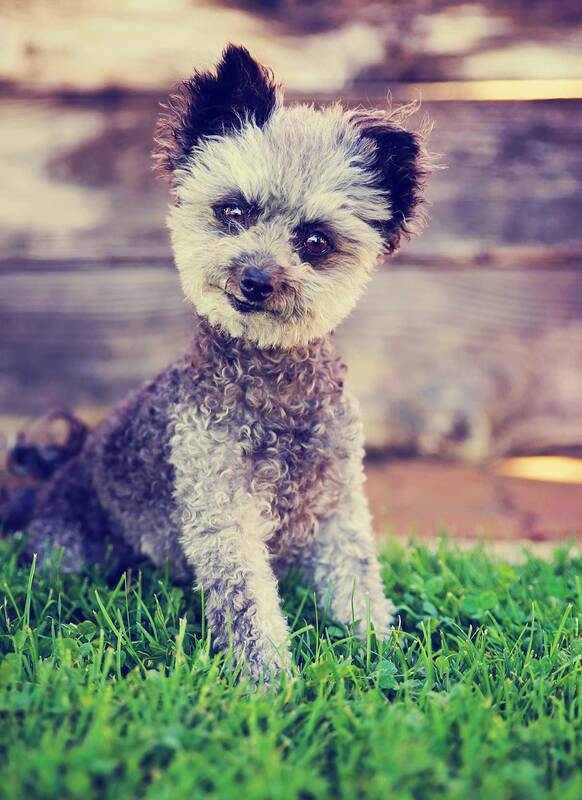 Though there are three different sizes of Poodle, including Toy, Miniature, and Standard, only the first two types are usually parents of the Chihuahua Poodle mix. The size difference between the Standard Poodle and the Chihuahua precludes their mixing. Though Chihuahua Poodle mixes are still slowly growing in popularity, the parent breeds are quite famous! Celebrities such as singer Joss Stone love their Poodle pups, and actresses like Demi Moore and Reese Witherspoon adore their Chihuahuas. A mixed breed like the Chipoo offers diversity in style. As a hybrid, the Chipoo will have a mix of characteristics from each parent. The Toy Poodle Chihuahua mix full grown weighs anywhere between 3 to 20 pounds and can stand from 5 to 15 inches. Crossbreeding accounts for some of the variance in weight and height. On average, a Toy Poodle is around 10 to 15 inches tall. Chihuahuas, though, are celebrated for their very tiny stature. Their height doesn’t normally rise above nine inches. The head of a Chihuahua Poodle mix could be apple-shaped like the Chihuahua or rounder with a long nose like the poodle. The coat is another place where genetics like to make this hybrid a little different. Poodles are known for their sculpted grooming. Grooming gives them the aristocratic look that defines the breed. A Chihuahua’s coat can be long or short and curly or smooth depending on the characteristics of the parents. 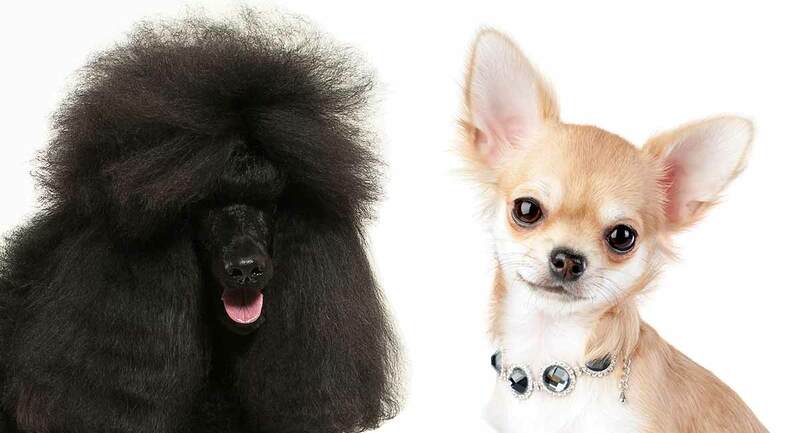 Chipoo puppies, even from the same litter, can have coats that differ both in hair length and texture. These dogs may be a solid color like a Poodle or have a pattern of colors throughout the body which is a possible characteristic of the Chihuahua. Remember Mighty Mouse, the tiny little superhero with red trunks, cape and a big attitude? If Mighty Mouse were a dog, he’d be a Chipoo. It’s known for both its intelligence and its energy—a lot of energy! Like both parents, the Toy Poodle Chihuahua mix is usually devoted, loving, and affectionate. Its intelligence makes this dog easy to train. The Chipoo tends to bond with one family member in particular. The high energy level of the Chi Poo means they get bored easily, so leaving them home alone for long periods of time outside a kennel can lead to disaster. The Chihuahua Poodle mix interacts well with other dogs or different kinds of pets in the home when they are all raised in the same environment. It is more difficult to get them to accept a new dog coming into the family, though. Much like the Chihuahua, they can be fiercely protective of their humans and may bark and snarl at other dogs if they get too close. Early socialization can help them to be more accepting of strangers in the home and out at the dog park. Chipoos love to play but can get a little over excited in a way that is may be overwhelming for young children. For this reason, they are better suited to homes with children over the age of 10. Training and socialization are incredibly important in properly raising a dog, no matter what the breed. And the Chipoo mix is no exception! Potty training may be an issue, as the Chipoo may tend to be excitable. Check out our guides to potty training and crate training for some expert-level advice. The Chihuahua Poodle puppy comes from two highly intelligent breeds and will benefit from positive reinforcement training. For some specifics on training Chihuahuas, check out our detailed guide. They love to play and toys work to keep them stimulated. Without that stimulation, the dog will get bored and unhappy. Walks provide good exercise. Keep in mind their legs are small, so the walks should be short but frequent. Let them run when possible, as well. 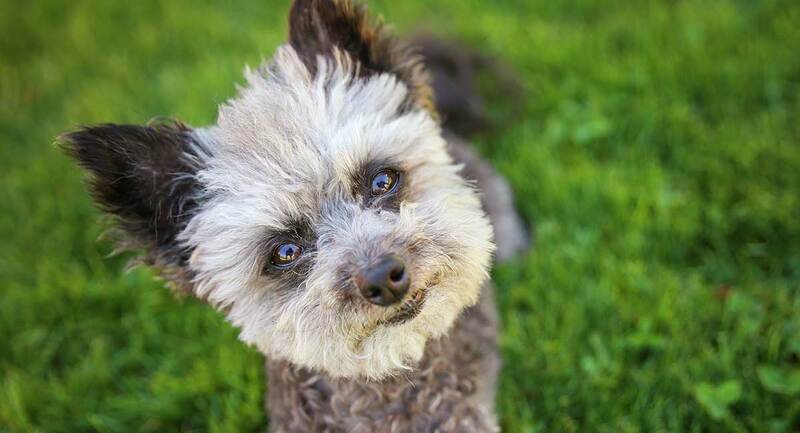 A fenced in backyard is ideal for a playful puppy like the Chipoo to get as much exercise as they need. First generation mixes like little Chipoo puppies are surrounded in a bit of controversy, much of it myth, explains Carol Beuchat, Ph.D. In fact, Chipoo puppies are less likely to face diseases that are common in their parents based on a 2006 study conducted by the University of Sydney. Inbreeding among purebreds can make them more prone to genetic diseases. For example, the Chihuahuas can develop conditions like patellar luxation, glaucoma or even hemophilia. Poodles, on the other hand, inherit stomach problems and cataracts. By breeding these two together, the risk is potentially reduced and the Chipoo my gain benefits from both breeds. There is no way to predict the outcome of breeding, though. Crossbred dogs like the Chipoo are at risk for the same conditions that affect their parents. Dental problems are also common among small breed dogs as their tiny jaws make their teeth inherently weak. For this reason, the vet may suggest daily brushing, regular cleanings, and a dry food diet. Poodles can be prone to Addison’s disease, a condition that affects hormone production. A Chipoo might also be at risk as one parent is a Poodle, although it is less common in Toy Poodles. It is important that each parent is health checked for all the diseases relevant to their breed before they are mated. The Chihuahua parent should have a clean bill of health from the vet, including no history of dental problems, or knee problems. They should also have no family history of necrotizing meningoencephalitis. The Poodle parent should be PRA clear, vWF clear, and have a recent clear eye test. They should also have no family history of luxating patellas, Cushings disease or heart problems. As small dogs, Chihuahua Poodle mixes have a decent expected lifespan. Chihuahuas live an average of about twelve and a half years, while Toy and Miniature Poodles live an average of about fifteen. So you can expect your Chipoo to live to somewhere in his mid teens. Some Chihuahua Poodle Mix puppies may inherit the Poodle’s low shedding coat, but this is not guaranteed. Long-haired versions of this dog may require regular professional grooming to keep the coat healthy, shaped and free from tangles. Home grooming with a soft bristled brush is recommended between trimmings for long-haired Chipoos along with a bath every few weeks to keep them tidy. Brush the long-haired Chipoo before bathing. Otherwise, their hair may mat. Short haired Chipoos also require regular bathing. Between baths, consider a wipe down with a wet cloth or doggie wipe. The Chihuahua Poodle Mix does well with the standard diets unless otherwise directed by the veterinarian. The vet will most likely recommend high-quality food made for small dogs to avoid common digestive issues and dental problems. They can get overweight, so monitor their diet closely and limit treats unless used for training or teeth cleaning. The small size of the Chipoo allows them to thrive in apartments and houses. They do well as a family dog but are better suited to older children or homes with no kids. They’re social animals and will want attention. Leaving them alone for long periods of time may result in destructive behavior. Since the Chipoo is crossbred, they can have different temperaments and be somewhat unpredictable. But if you love both Chihuahua and Poodle temperaments and don’t mind which combination you end up with, then you should be happy with the outcome. It isn’t always easy to find the cross you’re interested in. At times it’s much more difficult than finding a purebred from a reputable breeder! But if you can find a puppy or adult Chihuahua Poodle mix, it’ll surely warm your heart to be able to adopt a dog in need of a good home. Adopting a rescue dog also often has the added advantage of enabling you to know what the dog will be like, since dogs in need of adoption are frequently a little bit older. The cost of adoption will also be lower than getting a puppy from a breeder. For some suggestions as to where to look for a Chipoo adoptee, take a look at the list of rescues found here. Due to the small size of this breed, newborn puppies require a lot of care, so reputable breeders can be difficult to find. You also may need to travel to get your puppy. Before purchasing a dog, insist on health screening for issues that commonly impact Chihuahuas and Poodles to ensure the puppy is healthy. Ask the breeder to see certifications of these screening tests. You should also meet the mother, and the father too if possible. Make sure that they are both friendly and confident, and have an obvious bond with their owner. They should also have a purpose in life beyond producing puppies, whether that’s as a show dog, agility dog, or an adored family pet. A good breeder will ask you lots of questions, and happily answer all of yours too. They will show you evidence of the parents health checks and have had all their puppies flea treated, wormed and checked by the vet. Expect to pay anywhere from 500 to 1,400 dollars for a Chipoo puppy. The average price falls in the 950 dollar range but may vary depending on the location and breeder. Look locally first for a breeder to reduce the cost. When you locate one with a puppy, ask for references to check out the breeder before buying. It’s incredibly important that potential owners avoid buying from pet stores and puppy mills. These irresponsible and at times cruel businesses are simply out to make a profit, often at the expense of the health and happiness of their puppies. For more information on finding a puppy from a reputable breeder, check out our step by step puppy search guide. It isn’t always easy to find the mix you want, but as crossbreeds (also known as “designer dogs”) are growing in popularity, it isn’t impossible either! Caring for a vulnerable Chipoo puppy is a big responsibility. You’ll find them listed on our Chihuahua Poodle mix puppy page. These, of course, are simply basic points. There’s a lot more to be considered with the Chipoo! The Chi Poo has a lot to recommend it—but it also has some things in common with some other mix breed dogs! Take a look at the guides to these other mixes for comparisons and similarities. The Chihuahua Poodle mix isn’t for everyone, of course. If you like certain features of this mix but aren’t sure about others, take a look at these suggested mixes that may more closely fit what you’re looking for. In addition to the mixes found in the section above, one of these may be a better option for you and your situation. These rescue centers are located in various places around the world, so you can search for your local area. Do you know of any other rescues for this mix or the parent breeds? Leave us a comment below! Beuchat C. 2015 Health of Purebred Vs Mixed Breed Dogs; The Actual Data. This article has been extensively rewritten and updated for 2019. Hey. My name is Sara and I live in Sweden. I search for chihuahua/poodle mix ar Google just because i want to find If maybe maybe i could find a pic like my dog Kiara Who is a chihuahua/poodle mix. And so i found this side and The dog in this text is exactly like my dog, almost i thought it was my dog. I would be so happy if I could get contact with The owner so I can show her/him pictures of my Kiara. It is awesome. My english is not The best but I do my best ? thank you!! What kind a food dog you give your dog mine is a puppy 2 months?